In Chicago, they are preventing lead poisoning in young children. In Chatham County, Georgia, they are building a continuity of care system for jail inmates, and in Washington State, they are using multiple data sets to coordinate care for dual eligibles. More than 40 applicants responded to the call for nominations. 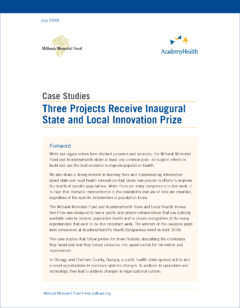 A group of expert reviewers looked for projects that demonstrated innovation in overcoming traditional public sector barriers and challenges to leveraging data for policy and programs; measurable impact on specific metrics of population health; sustainability of effort and likely future impact on policy and programs; and the potential to scale and/or replicate. The winner, the Chicago Childhood Lead Paint Data-Sharing Project, and two runners-up were announced this past April at Health Datapalooza, AcademyHealth’s conference that promotes increased access to and use of publicly available data to improve the health of populations.